When you think about pairing cheese with a beverage, the first one that probably comes to mind is wine. After all, wine and cheese are a classic duo that have been making each other look good for thousands of years. But America's craft breweries are getting better all the time, and Americans are following suit, appreciating beer in the same way we've been taught to savor wine. Craft-beer devotees look for complexity and flavor, not just alcohol content, and they want a beer that has been made with the same time and care put into wine production. So why not pair a quality craft beer with a quality artisanal cheese? When pairing a beer to a cheese, Fletcher says, you can choose to play up either the contrasts or the similarities with textures and flavors. “What I typically do is taste the beer, then taste the cheese, then go back to the beer to see if the beer has changed,” Fletcher advises. Here are eight beer styles and eight cheeses that pair well with them. To help inspire you, we’ve selected a specific beer and cheese from eight different regions of the U.S. Of course, you can also find similar beers and cheeses in your own region — and you should do so at your first opportunity. #(clear n1). Pair a brown ale with Asiago or Romano. The malty, slight nuttiness of brown ale blends perfectly with nutty, almost sweet asiago and romano cheese. In the Mid-Atlantic region, try Legend Brewing Co.’s brown ale (made in Virginia) with the Redneck Romano cheese made by Ashe County Cheese in North Carolina. #(clear n2). Pair Hefeweizen with feta or any goat-milk cheese. Hefeweizen’s wheaty taste needs a tangy goat milk cheese, like feta, to cut into it. In New England, try C.H. Evans Brewing Company’s hefeweizen (brewed in New York) with the feta made by Catapano Dairy Farm in Peconic, New York. #(clear n3). Pair stout with creamy Gorgonzola. Texturally, both a stout and creamy gorg share a delicious creaminess. In the Midwest, try Bell’s Brewery’s Expedition Stout (Michigan) with the CreamyGorg made by BelGioioso Cheese in Green Bay, Wisconsin. #(clear n4). Pair pale ale with Gouda. 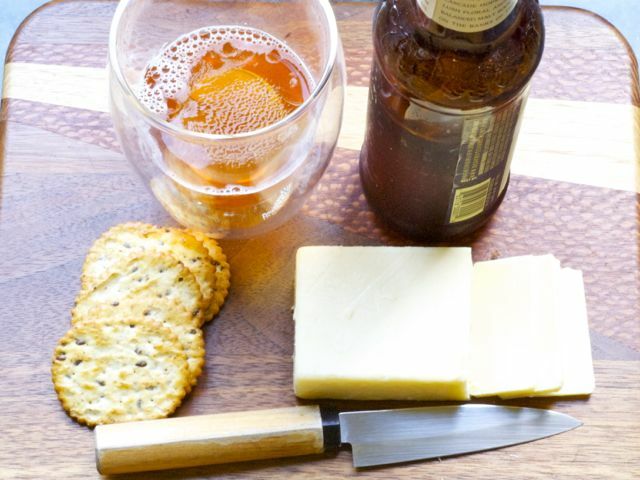 Gouda’s buttery texture and mild flavor pairs well with a milder beer, like a pale ale. From the Central region, try Nebraska Brewing Company’s NE Blonde with the Gouda made by Branched Oak Farm in Nebraska. #(clear n5). Pair barley wine with blue cheese. Barley wines are full-flavored beers with high alcohol and a hoppy taste so they’ll need a pungent cheese to back it up. In the Pacific Northwest, try Hair of the Dog Brewing Company’s Doggie Claws (Oregon) with the blue cheeses made by Jacobs Creamery (produced in Washington, but sold only in Oregon). #(clear n6). Pair sours with triple-cream cheese. A smooth triple crème cheese will help tone down the super sour taste of a sour beer. In California, try The Bruery’s Sour in the Rye with the Triple Crème Brie made by Marin French Cheese in Petaluma. #(clear n7). Pair India Pale Ale with Cheddar. The salty taste of a good cheddar holds up well to the pungent IPA. In the Rocky Mountain region, try Glacier Brewing Company’s Wildhorse Island Pale Ale (Montana) with the Cheddar made by Montana Lifeline Farm. #(clear n8). Finally, pair lager with Colby or Jack cheeses. A refreshing, classic lager pairs best with a mild cheese such as Colby so neither beer nor cheese overwhelms the other. In the Southwest, try Oak Creek Brewing’s Gold Lager (Arizona) with the Monterey Jack made by the Arizona Cheese Company.